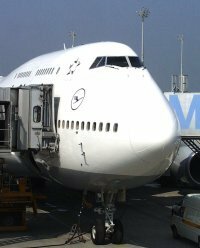 " This brand new 747-430 cost Lufthansa about $175 million to build. But you can build your own 747-430 for only $59.95 with Aircraft Factory 99. You'll save about $ 174,999,940.05." Adds aircraft designed by Terry Hill to Microsoft Combat Flight Sim, Microsoft Combat Flight Sim 2 and Microsoft Flight Simulator 2000.